Egypt will formally recognise the state of Kosovo, following a landmark deal between Kosovan and Serbian leaders that will mean relations between the two countries are normalised. According to Ahram’s Arabic website, Egypt was waiting for this move in order to recognise Kosovo, because of its strong economic, commercial and industrial relations with Serbia. According to sources, the reasons for not recognizing Kosovo have also included the close relations of Kosovan Prime Minister Hisham Tachi and the Israeli government. Tachi already expressed admiration for Israel during his last visit to the country. 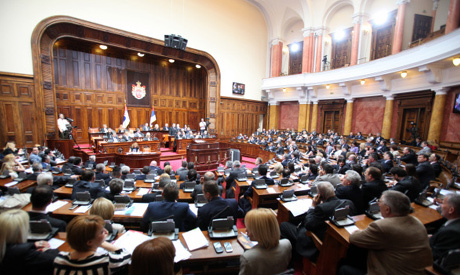 Serbia's parliament on Friday began debating whether to green light an EU-brokered deal aimed at normalising ties with former foe Kosovo, a landmark accord already approved by the government. The deal, which has come under fire from ultra-nationalists and Kosovo Serbs, is expected to win vast backing in the 250-seat parliament, as MPs from the ruling nationalists' coalition and from the centre-left opposition have already indicated they would vote in favour of it. The premiers of Serbia and Kosovo hammered out the deal on April 19 with both sides under strong pressure from Brussels to improve relations if they want to move closer to the European Union. The European Commission on Monday recommended the launch of formal negotiations on Serbia's EU entry. It also recommended starting negotiations with Kosovo on an agreement that would bring Pristina closer to the 27-nation bloc. Belgrade and Kosovo Serbs refuse to recognise the 2008 independence of Kosovo, although more than 90 countries, including the United States and all but five EU member states, have done so. Serbia lost control over its former southern province in June 1999 after a NATO bombing campaign halted late strongman Slobodan Milosevic's crackdown against the pro-independence ethnic Albanian majority and ousted Serbian armed forced from Kosovo.